Grasshopper Jungle is a rollicking tale that is simultaneously creepy and hilarious. It's propulsive plot would be delightful enough on its own, but Smith's ability to blend teenage drama into a bug invasion is a literary joy to behold Smith may have intended this novel for young adults, but his technique reminds me of Kurt Vonnegut's in Slaughterhouse Five, in the best sense. 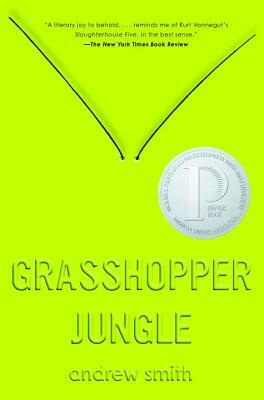 "New York Times Book Review"
Funny, intense, complex, and brave, "Grasshopper Jungle" brilliantly weaves together everything from testicle-dissolving genetically modified corn to the struggles of recession-era, small-town America in this groundbreaking coming-of-age stunner from the author of "The Alex Crow"and "Winger." Andrew Smith is the award-winning author of several young adult novels, including the critically acclaimed "Winger" and "The Marbury Lens." He is a native-born Californian who spent most of his formative years traveling the world. His university studies focused on Political Science, Journalism, and Literature. He has published numerous short stories and articles. "Grasshopper Jungle" is his seventh novel. He lives in Southern California. You can learn more at authorandrewsmith.com and follow him on Twitter: @marburyjack.